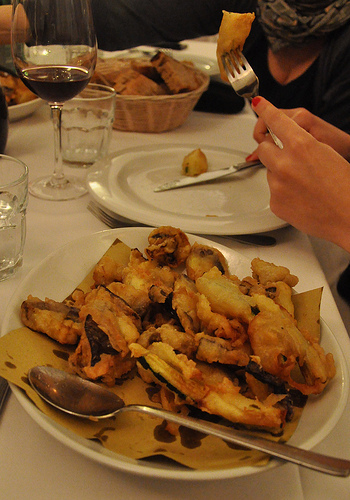 On this food lover’s night in Rome, I met up with the couple behind Tavole Romane. 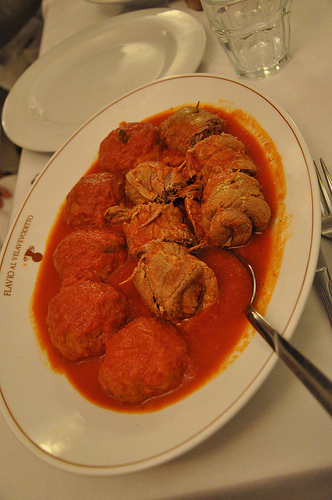 They have both a food blog about dining in Rome, and give delicious food tours in and around Rome. Their blog posts about good eats in Rome have been a part of our Eating Italy series, and they wrote this sweet guest post for FLO about Best pastry shops in Rome for Christmas sweets. 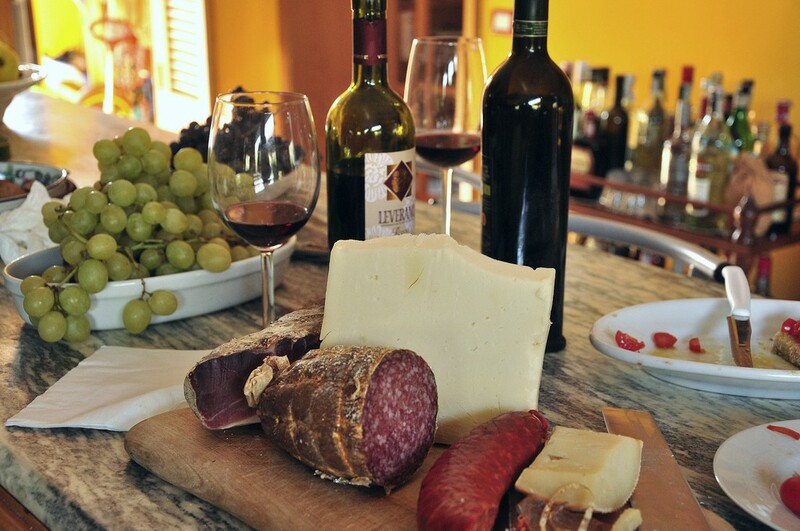 They invited me to join them for a private version of their Roman Cuisine Sit Down Meal tour. Also at dinner with us was Giovanna and Joanne, the ladies who lead these tours. 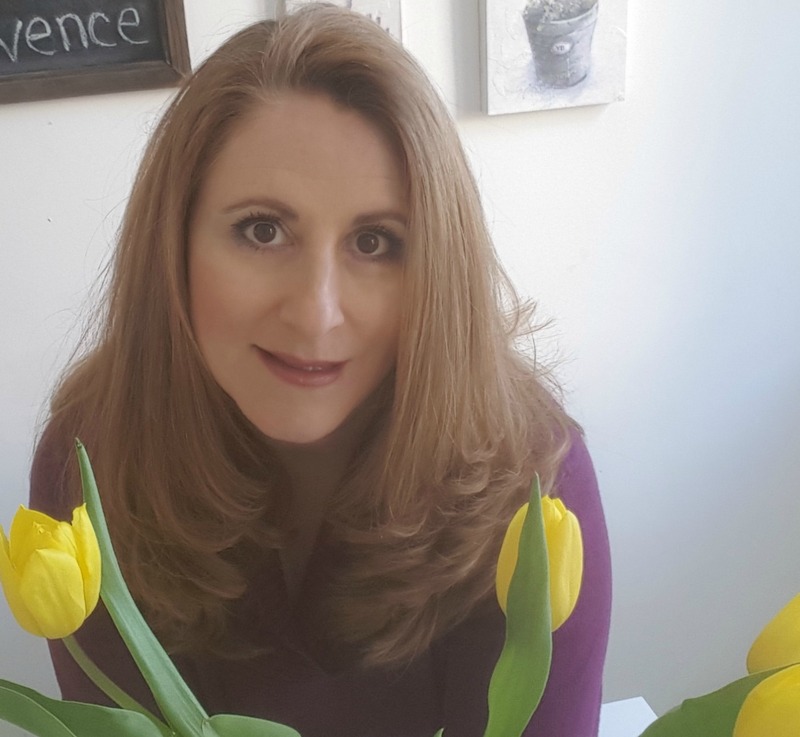 Giovanna publishes the Italian food blog Burro e Alici and has Roman ancestry as far back as she can search. Joanne is an Italian-American by birth and Roman by adoption. She is a sommelier who has lived in Rome for around 30 years and knows her Roman cuisine and where the best of it is in the Eternal City. Their knowledge of Roman cuisine was exceptional, but even more impressive was how passionately all four talked about each dish, the process of making it correctly (there are many rules, you know), and the dish’s place in the history of Rome and its cuisine. The osteria is even on a historical sight. 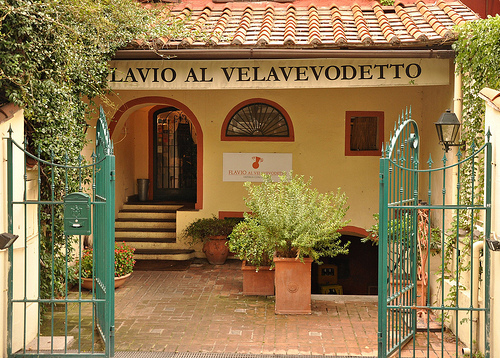 Flavio al Velavevodetto is set into Monte Testaccio. 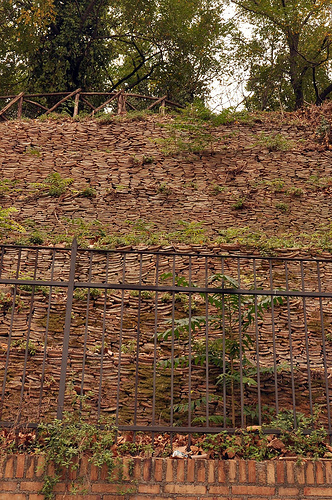 The approximately 115 foot “mountain” is more like a hill, or even a heap, created by discarded olive oil amphorae dating back to at least 200 AD and possibly even the 1st century BC. 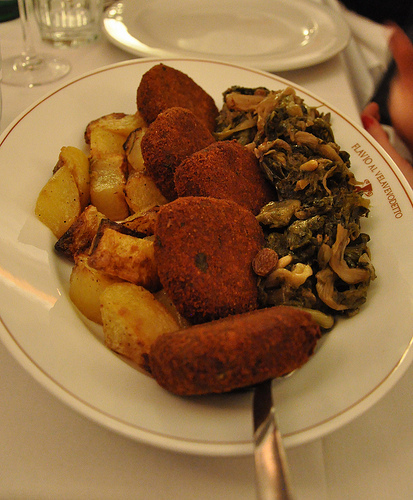 The pasta course consisted of two of Rome’s classic dishes. Our first plate of pasta, (and it was about the same size as the size of the pasta plate above) was rigatoni alla carbonara. But, as I said earlier, there are rules. When the carbonara sauce is at its perfect consistency – a creamy yellowy emulsion of cheese and egg yolk, there is no time to waste taking pictures. You must eat it while it’s hot and quickly! The second plate of pasta was tonnarelli pasta, made in-house (long spaghetti-like pasta but much fatter in diameter) with cacio e pepe (cheese and ground pepper). Both these dishes seem easy to make, but timing and coordination are everything. Add the cheese and/or the egg yolks at the wrong time and don’t mix it quickly enough and instead of a silky sauce you have a lumpy mess. A mistake in timing, temperature and coordination with the carbonara and you get scrambled eggs. At Flavio al Velavevodetto, they executed each dish perfectly. Probably the best tiramisu I’ll ever have. It’s a variation on the classic dessert and in a cup. Flavio makes a crunchy cookie in house that stays crunchy even while floating in all that cream. There are pieces of choclate in the mascarpone cream. And on top is the squaglio di cioccolato (melted chocolate). In between spoonfuls of an oh-so-decadent mascarpone cream, you get chocolate pieces and melted chocolate along with the crunch of the cookie for a really nice textural contrast. Joanne tried to hide hers under a napkin “tent” so she would stop eating it. I don’t think it worked, though I was too busy devouring my cupful. 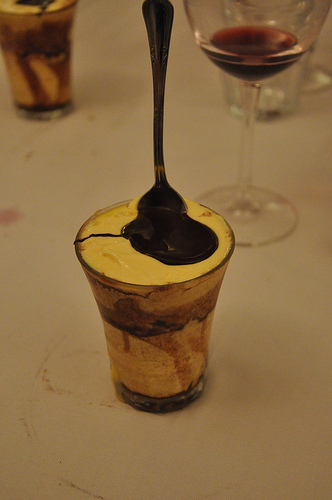 Yes, we were all very full from the meal, but just couldn’t stop taking spoonful after spoonful of the tiramisu. Yes, I asked for the recipe, but I’m pretty sure Flavio’s not sharing it. Be sure that the first kitchen I’m in during my travels, I’ll be trying to replicate this dessert. Along with the dinner, Tavole Romane gave me their tradition tour gift bag with another sweet that was almost as addictive as the tiramisu. 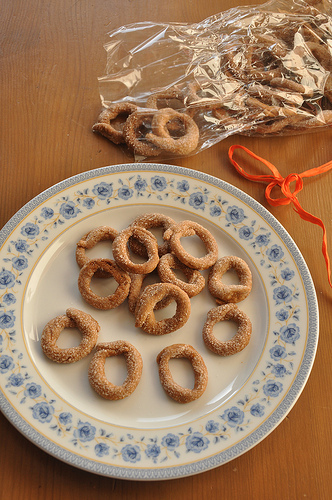 In the bag were Roman cookies, ciambelline al vino, little crunchy cookies with a little wine added and shaped like a ring. 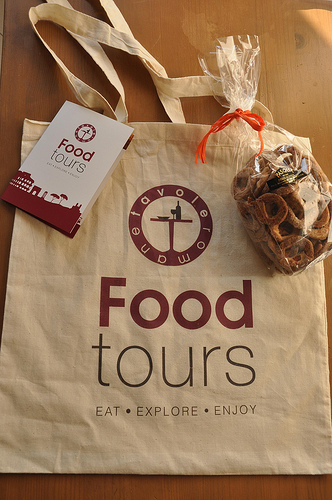 In addition to the sit down food tour they offer at Flavio al Velavevodetto, Tavole Romane also offers another sit down food tour at Asino d’Oro focussing on the creative cuisine of the city and offer walking food tours in many districts throughout Rome. 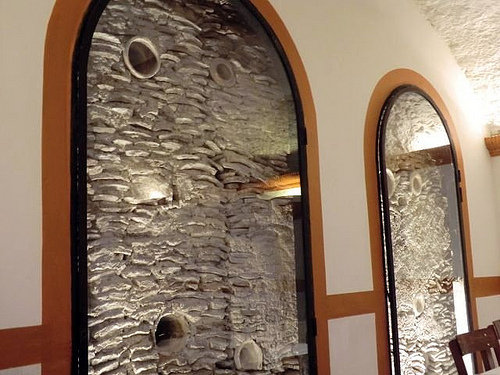 If you’re going to be in or around Rome on June 23, 2012, Tavole Romane is offering a special food tour where they combine Rafael paintings with a tasting lunch at the Michelin-starred Glass Hostaria for a really great price of 65 euros. Thank you for this amazing post, we’re happy you liked so much Flavio and our sit-down food tours formula! I knew I should have gone to this restaurant on my trip. Just got back a few hours ago from Rome and Abruzzo and this was one of the places I never made it too – it’ll have to wait until next time. 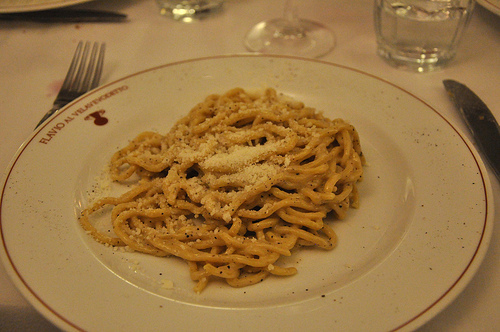 I had that cacio e pepe at Roma Sparita and talked to the chef and yes, they do use butter. I am all for tradition (no onions in Amatriciana) but I can’t argue with what was the best cacio e pepe I ever ate. Ahh, what an incredible meal Kathy, I don’t even know where to begin! And I’m sure you enjoyed every moment of the evening, especially talking Italian cooking and food with local experts, too fun! And love the location of the restuarant, what a great way to feel immersed in Roman culture. I have just happened upon your blog. How wonderful! You have so much information and fabulous photos. My family and I leave for 3 weeks in Italy in less than 3 months. Your blog is making me so excited. Can’t wait to eat!